For anyone who has a website and relies on Search Engine Optimisation (SEO) as their main source of free traffic, they will understand the importance of keyword research, and the need for a quality keyword research tool. When it comes to finding keywords for my articles and new websites, I couldn’t do without Jaaxy in my business. Jaaxy is the only tool I rely on. Jaaxy is the best keyword search tool I have found yet. Jaaxy will find you high traffic keywords with low competition for all types of online marketing and will significantly reduce the time you spend on researching keywords. So what is keyword search, and why is it important? If you are aren’t familiar with keyword research just yet, you will learn that this is critical when you are creating content for your websites. In fact, according to Neil Patel, “Keyword research is the blueprint for your online marketing efforts, driving every decision you make.” As far as Neil is concerned, keyword research is the most important part of digital marketing. There are over 500 million brand new keywords searched every day in Google alone. In order to leverage the billions of keywords in existence, you need a keyword tool that can do the hard work for you and dig as deep as you want. There are millions of keywords in every niche, leading to incredible potential. Every time you build content on your website, every page will target a brand new keyword that can be ranked. Keywords are the cornerstone of any successful, high ranking website. A keyword search tool is imperative. Here is an example search I did in Google. The search term “best dog breeds” is my chosen keyword, just off the top of my head. Google has returned the following most relevant results (see below) based on my search. When I click on one of these results, I am taken to a website that has been ranked in Google. If I purchase something from that page or click an ad, that website owner makes money as a result. 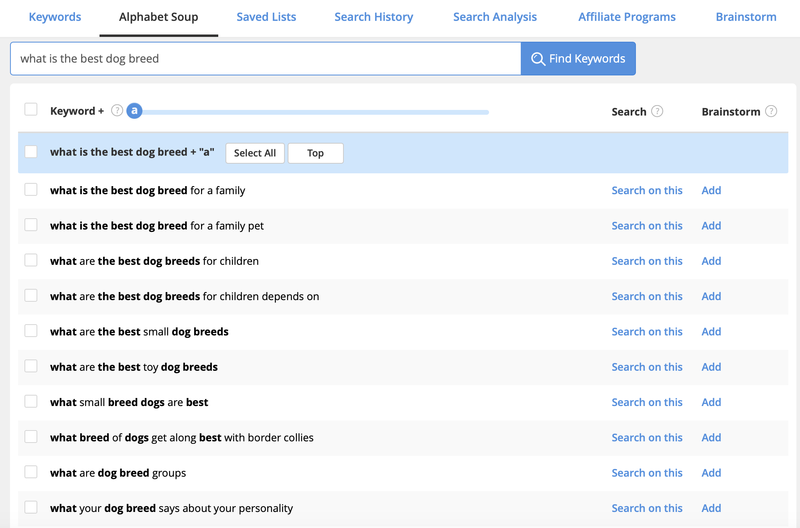 However, the search term “best dog breeds” is quite broad, so we might need to tighten up the search so we can get some very targeted traffic. Let’s take a look at some Jaaxy results. Here, I have keyed in “Best dog breeds”, as I did before when I did my Google search. The results show that “best dog breeds” as a search term isn’t great. Whilst the average number of searches for that keyword per month (Avg) is 7,592, the quoted search results (QSR) meaning the number of competing websites ranked in google for this exact keyword is high with 165; the keyword quality indicator (KQI) only sees this as an “OK” keyword. As you can see from the Jaaxy results, there are several columns of “keyword data”. These are all very important when it comes to choosing keywords that are going to be useful to you. Keyword. This is the search phrase that the data to the right of it is representing. The keyword must make grammatical sense. If the keyword doesn’t make grammatical sense, don’t use it. QSR. This is Quoted Search Results, and is the exact number of results in Google that you are competing with under this search phrase. This indicator is really showing you how much competition you have. You want this number to under 100, and the lower the number the better. KQI (Keyword Quality Indicator). Jaaxy works this out for you, and categorises your search terms. Go with the ones that make grammatical sense and are green for “Great’. In this example, far better keywords would be “Best dog breeds for people with allergies” and “Australian dog breeds”. Both of these search terms make grammatcial sense, have a monthly search of greater than 30, a QSR less than 100, and are “Great” according to Jaaxy. If I were to use either of those as my keywords rather than just “best dog breeds” I would be found more easily as a result of a Google search. So you can see why it’s important to understand the search terms that people key in to Google and other search engines, and the importance of a tool to help do the work for you. Here is a link so you can try it out for yourself. When you are finished, just hit the back button to return to this page. “What on earth is the alphabet soup technique?” I hear you ask. Well essentially it is a keyword research technique that makes use of the google auto complete feature of the search engine, without you needing to do the work. So when you go into Google, you’ve seen Google auto complete words as you’re keying them in? Well think about that on steroids within the Jaaxy tool! This is just a snippet for the letter “A”, it goes through the entire alphabet. The Alphabet Soup technique within Jaaxy certainly saves a lot of time and you can immediately research each keyword individually for competition and traffic volume potential. This technique has huge potential and can help you immensely with content creation ideas and research. Jaaxy has the incredibly helpful feature of being able to check specific keywords you've used to see how they're ranking in Google, Bing and Yahoo. It's so easy to use. Just enter the keyword and Jaaxy does the rest for you. These images show the Jaaxy results of some random posts I chose from my site. 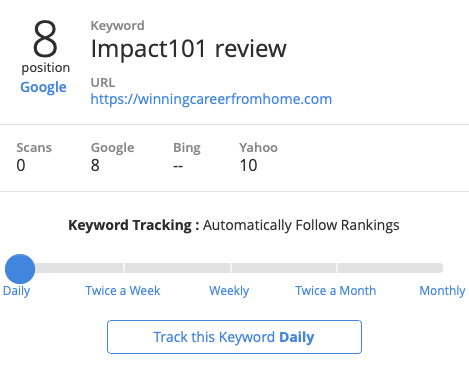 You can see that for the keyword "Impact101 review", the post is at position 8 on Google, position 10 on Yahoo, and doesn't yet feature on page 1 of Bing. 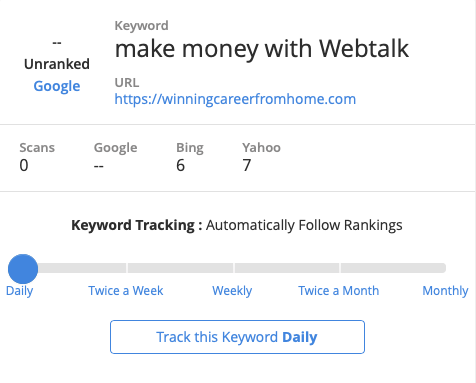 Conversely, for the keyword "make money with Webtalk" this keyword is at position 6 on Bing, 7 on Yahoo, but has not yet reached page 1 of Google. You can also track these keywords over time to see how they are performing. If you’re looking for lucrative affiliate opportunities, you can search, find and analyse affiliate programs using the Affiliate Program search function. Within the Jaaxy database there are over 15,000 affiliate programs. Every search within Jaaxy will show you which .com, .org and .net domains are available for the given keyword. This is a quick and powerful way to come up with valuable domains. You can also save and manage your domain lists ready for purchase. Jaaxy allows you to understand what your competition is doing in terms of SEO and determine the factors that are contributing to their rankings. Jaaxy uses its algorithm to take the results from any search and uncover what the top ranked websites are doing. Jaaxy is completely integrated for both Wealthy Affiliate Starter and Premium members. This membership is an introduction to Jaaxy. 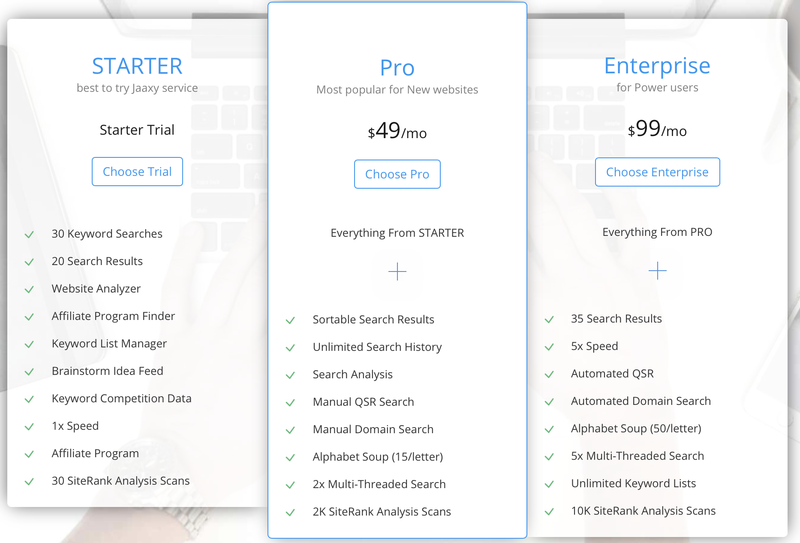 You can get a taste of the power of Jaaxy with the Wealthy Affiliate free starter membership along with some features including the Keyword Search, QSR (Competition Data), Domain Search, SiteRank, Keyword Lists, and the Alphabet Soup Platform. The Jaaxy Lite membership is available at no cost for Premium Wealthy Affiliate members. It includes everything in the starter plus unlimited keyword searches and more SiteRank features. This a powerful version of Jaaxy and includes unlimited access keyword searches, a more robust SiteRank tool to track your keyword rankings site wide. It includes a larger subset of search results than Lite. The Enterprise version is targeted towards intermediate to an advanced online marketers, affiliate marketers, merchants, amazon sellers, and local marketers. It takes automation of SEO to a whole new level with SiteRank Tracking that allows you to automatically track your rankings in Google, Bing and Yahoo over time. If you combine Jaaxy with Wealthy Affiliate, you have huge leverage with your online business. One of the many great things about both Jaaxy and Wealthy Affiliate is the ability to test things out for free without having to provide any credit card details. If you like the products and see value in upgrading to paid versions, you can. You can also remain a free member with no obligation to upgrade. Either way, you win. 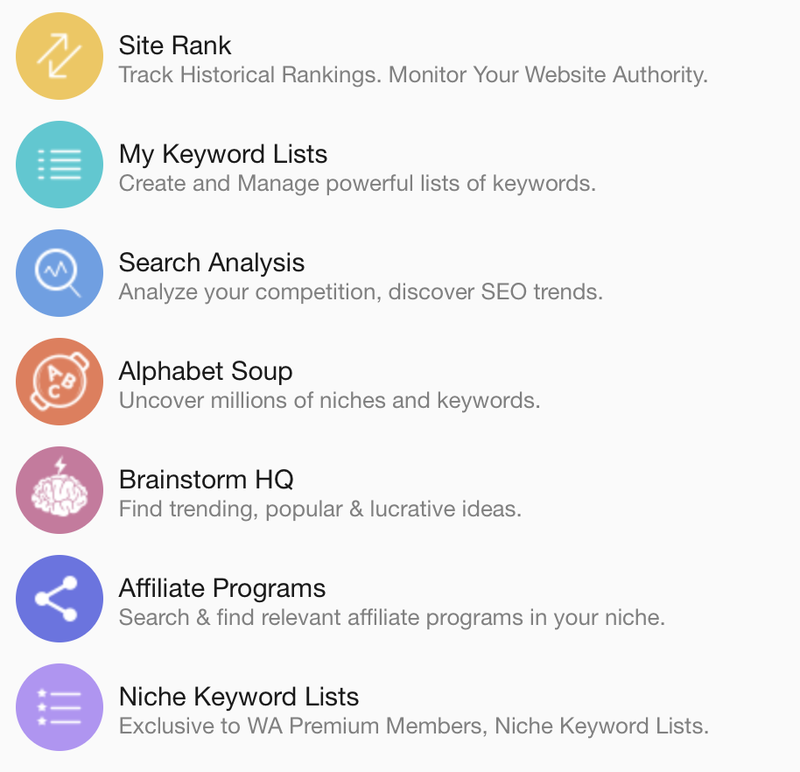 What other keyword tools have you used? Be sure to leave me a comment or a question and I'll be happy to help.